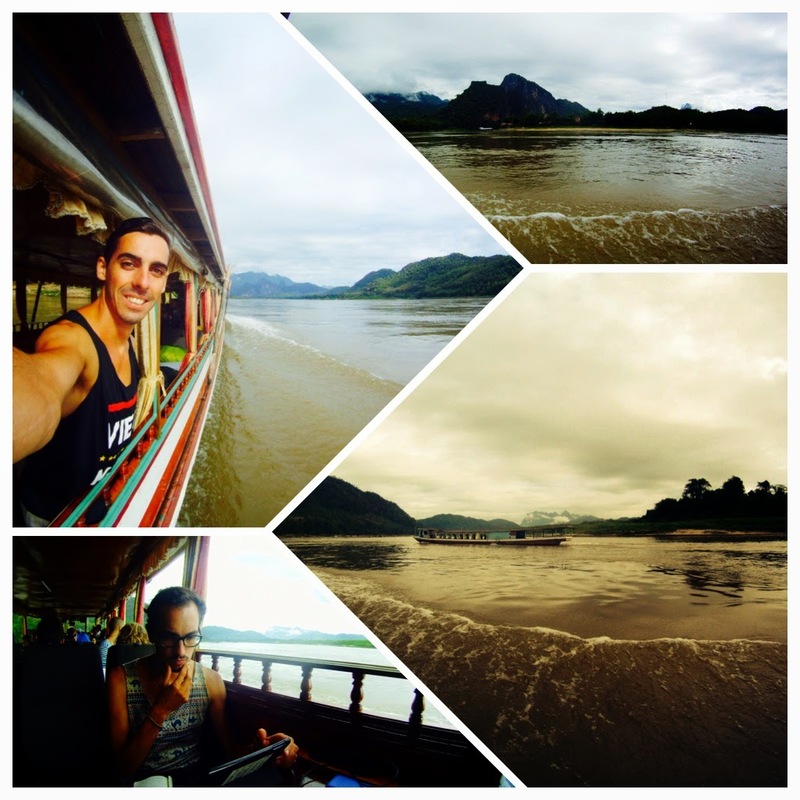 The slow boat up to the Thai border was a trip I had been looking forward to for a while. After taking bus and train over every other border crossing so far the prospect of having some variety was a little exciting. The long wooden barge had enough space to keep us pretty comfortable and the steady unrelenting fight upriver provided a great photograph opportunity as the we passed jungle matted mountains and small river communities. The journey was certainly the most comfortable experience we had on public transport in Laos. No pothole ridden roads, no chance of colliding with a lorry when your driver decides to overtake on a blind bend, no livestock under the seat and no sharing your seat with a whole family. Just a nice slow, meandering trip upriver whilst reading a book and listening to the ripples, gurgles and splashes from the greatest mass of fresh water in South East Asia. The only annoying thing was listening to comments from other passengers asking "why is taking so long" and "this is dull". Well sorry if this isn't a thrill ridden experience but you have purchased a ticket on something clearly advertised as the slow boat up the Mekong. Not a booze cruise in a catamaran, not a water jet pack ride where you can glide through the ever present H2O like a dolphin, a SLOW BOAT!!!! So sit down with your 200ml rucksack you have for two weeks travel, packed full of instant food as you don't trust the local cuisine because you heard on Wikipedia that someone, somewhere caught bubonic plague from some sweet & sour chicken and shut up. Despite the moaning of Mr P. Brain Jnr the first boat took eight hours to reach the halfway stop at Pakbeng. There's really nothing to this small village and if it wasn't for the steady stream of passengers looking for a place to spend the night, the guest house hosts and restauranteurs would still be living off the river. However, in many ways Pakbeng gives you your first or last taste (depending which way your travelling) of Laos culture. After a busy day doing nothing the village is a nice place to enjoy a laid back way of life. The boat on day two was a little less spacious. The four facing seats with a table in the middle had been replaced with rows of two but a small sacrifice in social atmosphere was a small price to pay. If anything it helped ensure that I and Mr P. Brain Jnr would never have to chat. The second day was identical to the first. The scenery remained impressive as you lay back and track the suns path across the horizon. The boats do have basic amenities like a toilet and free boiled water for tea and noodles (if you have them), which brought back memories of the Trans-Siberian. Once again it's about eight hours until you reach the border town of Huay Xai. As you'd expect Huay Xai is larger than Pakbeng and therefore has slightly better guesthouses available. It's also popular as a base for people booked on the Gibbon Experience where you can trek, climb, zip line and live in a treehouse for a few days. This was a little out our price range but we only heard great reviews. We decided to hold off the crossing until the morning to prevent us loosing a day on our Thai visa and spent the night at Phonethip Guesthouse. It's extremely cheap at £2 a night and has real comfy beds and piping hot showers. If your feeling peckish there are a few eateries around all offering a selection of Laotian or Western cuisine at around £2 a meal. Our last night in Laos was a comfortable one and at around 8:00am we caught a Tuk Tuk to the bus station where we purchased a ticket across the border to our first Thai destination Chiang Rai. For more information regarding the slow boat and guesthouses in Pakbeng and Huay Xai check out the links below.